Well I’m happy to announce I have made it to week two of the Whole 30!! I also caved and started to drink black coffee and whats more I don’t miss the sugar. It’s weird right? Anyway this is a beautiful salad will have your taste buds dancing. 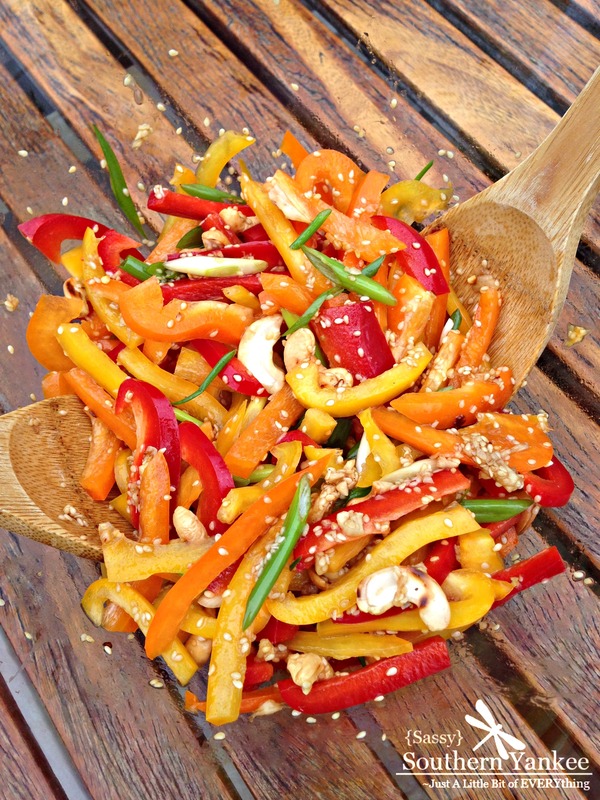 Thinly cut the pork chop then place it over a bed of Multi Colored Pepper Salad with Sesame Ginger Dressing. This was a quick and easy dinner and the leftovers were perfect for lunch the next two days! If you aren’t a fan of pork chops you can easily swap out chicken or shrimp. In a large bowl combine the garlic, ginger, lime juice, sesame oil, rice wine vinegar, coconut amino, chili flakes; once combined set aside. 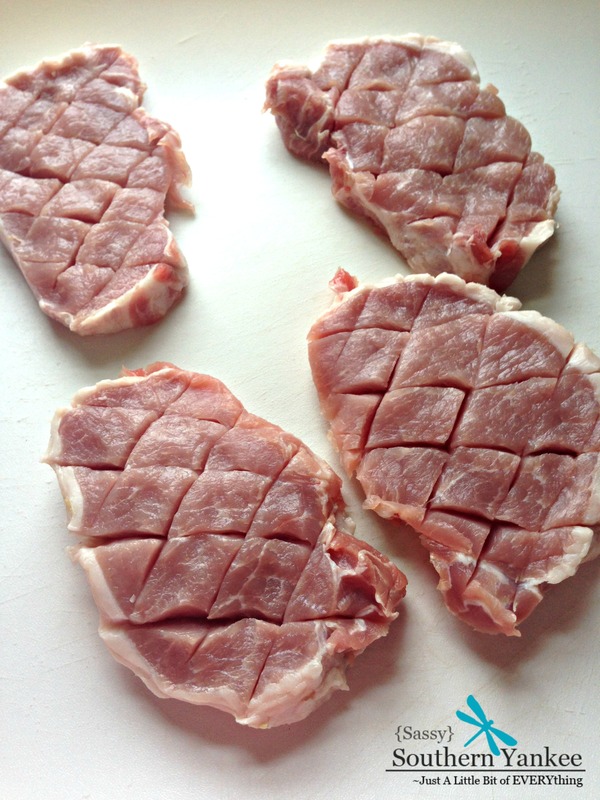 To prep the pork chops score one side of the pork chop with a diagonal pattern; cutting about half way through the chop. This will help the marinade infuse the chop and give you a juicy flavorful pork chop. Once you have the pork chop scored place them in a resealable plastic bag. Next add 2 Tablespoons of the dressing mixture squish it around in the bag; then set aside to marinate. Next pre-heat the grill and we will then get started on the salad. I don’t know about you but I love any kind of nuts but they are always better toasted! So in a small pan place the cashews and heat them over medium heat for about 2-4 minuets until slightly toasted. You need to watch them as they can burn quickly. Once they have toasted add them to the large bowl with the dressing. 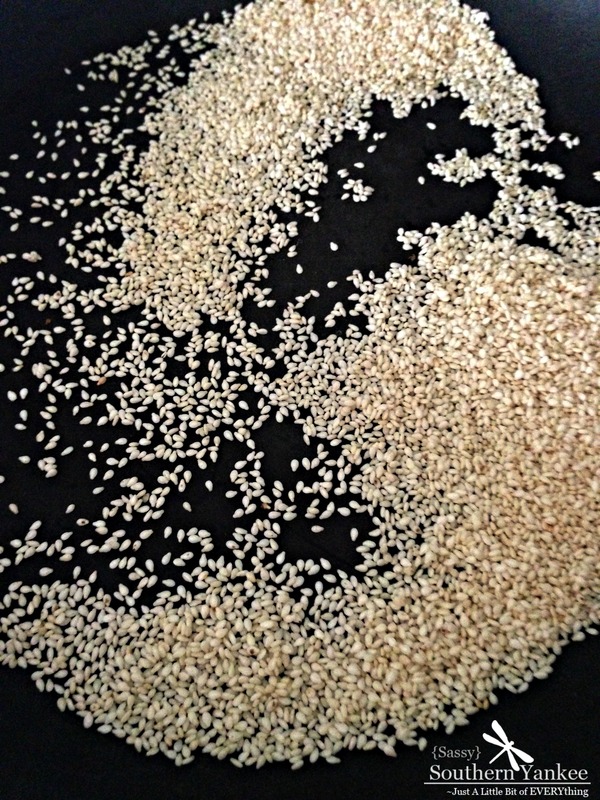 Now it’s time to toast the sesame seeds. I want to warn ya’ll in advance these bad boys will go from toasting to burnt in a heartbeat. Whatever you do not take your eyes off of them and make sure you are moving them about the pan the whole time. You want to toast them for about 3 minuets just until they have a hint of color; then remove from the heat and toss them in the dressing. 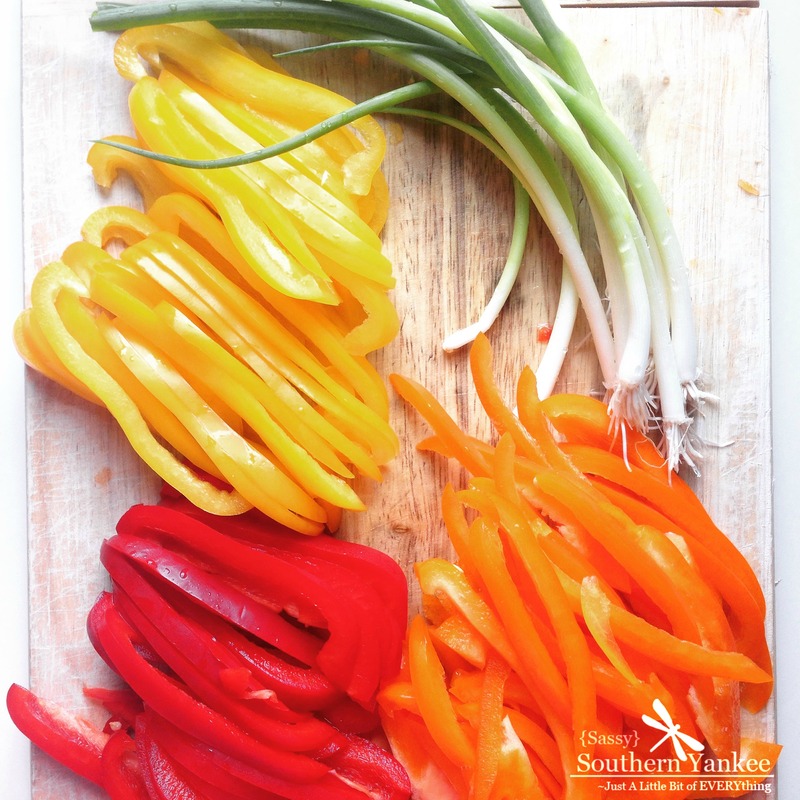 Using a sharp knife slice the peppers into thin strips. Then slice the scallions into 1/2 inch pieces I cut mine diagonally but you can do whatever you like. Toss the peppers and scallions into the bowl with the dressing ensuring everything is coated evenly; set aside to let the flavors mingle while you cook the chops. I cooked my pork chops over the grill. I placed them cut side up to start and cooked them for about 4 minuets then turned them a quarter of a turn (I must have those beautiful grill marks) and cook for another minuet. Then flip the chops over and cook for an additional 4 minuets. The cooking time on pork chops can fluctuate depending on how thick your pork chops are; cook until juice runs clear. Once you remove the chops from the grill allow them to sit on a plate for 5 minuets before cutting into them. This allows the juices to redistribute giving you a juicy flavorful chop. Thinly cut the pork chop then place it over a bed of Multi Colored Pepper Salad with Sesame Ginger Dressing. This is a beautiful salad will have your taste buds dancing. This is a beautiful salad will have your taste buds dancing. 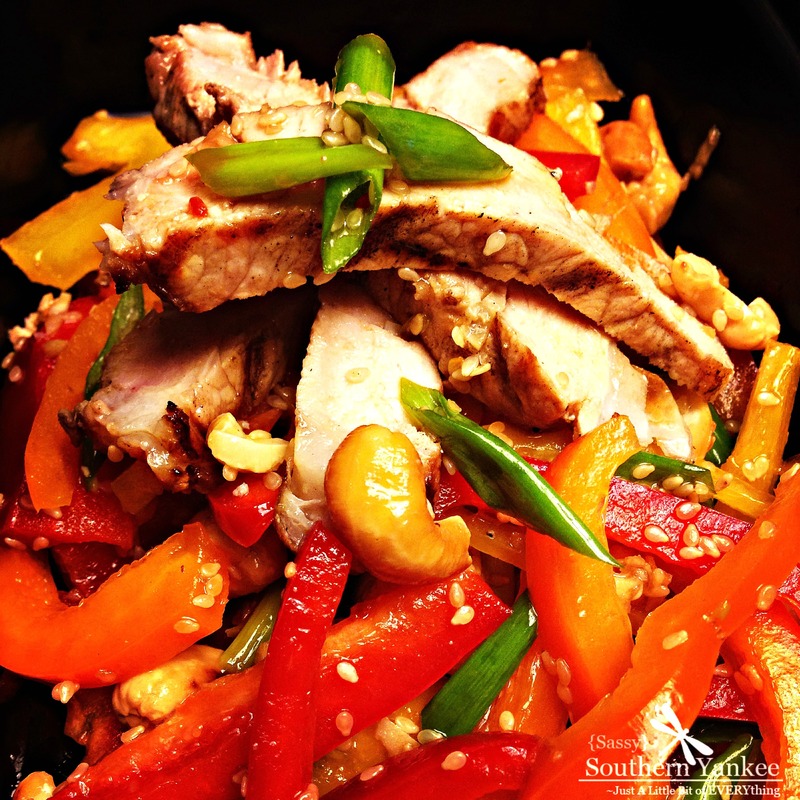 Thinly cut the pork chop then place it over a bed of Multi Colored Pepper Salad with Sesame Ginger Dressing. Next pre-heat the grill and we will then get started on the salad. I don't know about you but I love any kind of nuts but they are always better toasted! So in a small pan place the cashews and heat them over medium heat for about 2-4 minuets until slightly toasted. You need to watch them as they can burn quickly. Once they have toasted add them to the large bowl with the dressing. Now it's time to toast the sesame seeds. I want to warn ya'll in advance these bad boys will go from toasting to burnt in a heartbeat. Whatever you do not take your eyes off of them and make sure you are moving them about the pan the whole time. You want to toast them for about 3 minuets just until they have a hint of color; then remove from the heat and toss them in the dressing. Using a sharp knife slice the peppers into thin strips. Then slice the scallions into ½ inch pieces I cut mine diagonally but you can do whatever you like. Toss the peppers and scallions into the bowl with the dressing ensuring everything is coated evenly; set aside to let the flavors mingle while you cook the chops. This entry was posted in Salad, Side Dish and tagged Cashews, Clean Eating, Easy Dinners, Gluten Free, Healthy Meals, Low Carb, salad, Sesame Oil, Summer Salads, Whole 30, Whole 30 Recipies.